Becoming a workaholic can be dangerous. Even though you could be finishing a whole lot of work every day, chances are you are ruining your health and relationships with other. Most people become dull, monotonous and are not even able to enjoy themselves because they are the workaholics. I am sure you don’t want to become one of them. In this post we are going to discuss the signs of a workaholic and ways in which you can stop and control them. So give this post a good read and hopefully you’ll benefit a lot of it by the end of this! 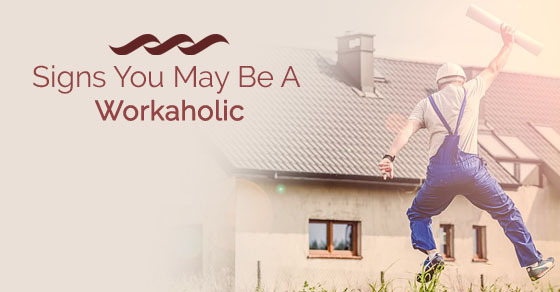 Are you a workaholic? Read these six points to know! If you have been coming to office earlier than everyone and find yourself so busy that you have to go after everyone’s gone, it could be a huge sign that you’re a workaholic. Some of you give yourselves that little bit of excuse that this is just work and some days are going to be hard and that you like coming early just because you want to focus, when in reality you are simply over doing everything. Take our advice and stop doing too much. Its not needed. A second sign could be that you work during lunch hours as well. It’s a horrible idea to skip lunch and keep working. I mean we completely understand if you skip maybe like once a month or something due to something urgent but if that’s becoming a habit, you might want to see that sign as a workaholic. Normal people don’t do that usually! Suddenly you aren’t being able to make time for your friends and family because you are so engrossed with work. It is taking up all your time. In fact many of your friends are actually pretty unhappy with you and your relationships are sort of ruining with time. If that is happening with you already, you have to stop working too much and get a control maybe. After all, your friends and family are far more important than some stupid job that just takes up all your happiness. A fourth sign you could be a workaholic is that you don’t have real hobbies anymore. All you do these days is work and hard work. Remember the time you loved playing guitar or going for a run with your best friend? If all of that has become a distant memory, you probably are not becoming a hard worker but a huge workaholic with time and need some changes to be made in your system right away. This is actually a very common sign among workaholic. People who are putting on too much weight are all so overworking that they just don’t have time for anything else. They eat whatever they have in front of them, they eat what gives them some satisfaction and then never make time for any exercise. If you havent been able to hit the gym in months and the reason is work, it could be huge signal you need to stop putting so much pressure on yourself because in no way it is worth your time. If you are getting too stressed these days, chances are you have become a workaholic. People who are very stressed can get mad at small things, be mean to others for no reason and don’t take time to get into an argument. In fact, the smallest of things can stress you out. If you can identify that with yourself, then probably its time you realize you’re in a bad situation right now and something definitely needs to be done about it. The Dangers of Being a Workaholic? Working for a very long period of time can become very stressful and dangerous for your health. Yes it is true, the number of hours you work, the more you get paid but if you are so busy making the money you will have no time to even spend together even in leisure. Without you realizing one bit, your life could become a huge mess. In fact, research says that a lot of people die sooner because of the stress they take during their youth. If you want to avoid this from happening, check out the following section. Now that you know you’re a workaholic, look for this workaholic symptoms and try these steps in order to stop them! The first thing you should do is just finish one before you think of starting with another one. Please do not feel like you have to do every single assignment that is given to you. You need to do one thing at a time. Just because you have so far wasted too much time on a simple piece of work, it does not mean that you have to waste a lot more time. There is no need to throw the good time after the bad. One of the best things you could is develop some self awareness which could stop you from becoming a workaholic in the near future. You should monitor the time that you are putting to work and make sure to take some notice when your work life is creating trouble in your personal life. You should also practice some disengagement, take some more vacations and set a few healthy boundaries so that you can come up with a better work and life balance which will stop you from becoming a workaholic. If you have been working yourself way too much, you should just take some time off and go on a vacation. If that is not possible, then at least go on a weekend getaway. Spend some time with family. Be with those who matter to you and make you happy. You may also catch up with old friends or a hobby you really haven’t practised in a long time. That could definitely help you break the monotony and come back fresh to work. If your condition is too serious, then it’s high time you consider going for some therapy. Sometimes we are so busy with work we don’t have time for ourselves as a result of which we need some time with someone who can understand us better. And if you really don’t have any friend who can discuss and hang out with you, a therapy would be the right choice for you. Try it! You will surely find some help after a few sessions! Another way to stop being a workaholic is by meditating or working out. Any kind of physical activity can really stop you from ruining your life. It will improve blood circulation, help you feel better and that will hopefully stop you from becoming a workaholic any more. People who workout or meditate everyday are less prone to becoming workaholic or becoming stressful. You could as well if you get it a try! We are sure there will be a huge difference felt after a few classes. If you want you can become productive over a very short period of time and hopefully stop becoming a workaholic. You can use the achievements you have had so far in order to calm down the workaholic conscience and in that way you can allow yourself to just calm down and set a work time of yourself. If you can stop becoming one, it does not mean that you cant really work that hard or work efficiently. You can in that way aim for something that is better in quality. But make sure you are setting limits that are sensible so that it doesn’t swallow your entire life. You should also limit the hours you have spent working on. You should keep at least one day of the week like Saturday or Sunday to yourself where you can be strict and not work at all that day. In fact, you should not be working during weekends. Also do not work after 7 or 8 pm. That will surely help you feel better than before. Always remember that your health is highly important and that you will not compromise anything with it. If you are not keeping too well on a particular day, you don’t have to go to work. Stay back at home and take your meds. There is no need for you to step out and over work yourself when your body is indeed calling for rest. Always remember that there are far more valuable things in life apart from work. Your health and family are of crucial importance and you should not sacrifice something like work for them. You literally depend on your family and health better than anything else. Plus when you spend time with people you love, you will have that sense of mental satisfaction. Come up with a daily or weekly routine of all the non work activities where you can spend time enjoying those things apart from work. This also includes work, exercise, prayer or even meditation of some kind. You could play music if you like, relax yourself or watch a couple of films. It would actually be a bit helpful to involve a bunch of other people like maybe going to walk together or play a few games or even meet up for a cup of coffee. You could call a few family members or even some of your close friends and have a night out with them. After waking up early in the morning, there is no need for you to do something productive right away. You can sit back and simply enjoy yourself, lie down for an hour, take a nap or listen to some of your favourite music. Do whatever makes you happy. You could also go back to sleeping again if you like. That might not be a bad thing after all. As far as you’re resting yourself, its really all that matters. You should always give yourself some time and space even when you are at work. Don’t keep working all the time. Take a 10 minutes break when you feel like you just can’t do it no more. Get up and walk around or go and grab a cup of coffee. You don’t have to keep working all the time. That is just not needed. Plus if you have been skipping lunch, please stop doing that as well. There is no need to stop eating because of work! This brings the post to an end. If you are a workaholic or know someone who is, share this post with them and help others get over this condition right away. If you have tried and tested some of our tips, leave us a comment below. We would love to hear some honest feedback. Apart from that, your questions are also looked forward to by us. So make sure to mention all of them. On that note, good luck and here’s hoping you will be able to come out of this situation soon.